BUDGET GUIDELINES Basis of Accounting A budget is a comprehensive guide for making financial and operating decisions throughout the fiscal year. The budget also assists in meeting the strategic priorities of Council. Departmental budgets are developed using a baseline budget, which includes inflationary increase and expenditures where the City has made legal and/or budgetary commitment, and service enhancements to allow the City to maintain the services levels its residents have come to expect. Service Enhancements have been budgeted based on Council’s Strategic Objectives as well as departmental goals and objectives. The year over year August 2018 Consumer Price Index (All-Items) per Stats Canada was 2.8%. The following guidelines play a vital role in preparing the budget: • alignment with Council’s Strategic Plan; • maintain existing service level standards; • mitigate future budget impacts; and, • implement proactive funding into the baseline budget for infrastructure. Budget Review Process The operating and capital budgets are done on an annual basis, with the capital plan being based on a 10 year capital plan that is updated on a yearly basis. In September of each year the City’s operational service maps are updated (Appendix 2). Baseline operating budgets are prepared by each Division with each Director reviewing the budget with their respective General Manager looking at past and current expenses. Any changes (service enhancements) to the baseline budget are presented to the Executive Team for review. The Executive Team debates individually each service enhancement to establish the operating budget. As part of the 2019 Budget Process for 2019 a Budget Survey was conducted. The results of the Survey are highlighted in Appendix 5. During Council’s Budget Workshop, all members of Council review and deliberate the recommended operating and capital budgets presented. Council may amend the budgets prior to approval. Fund Accounting The Budget organizes revenue and expense reporting into three funds (operating, capital and reserves) using the modified accrual method. Each fund has specific restrictions on the uses, as funds raised by one source cannot be used for another purpose. These funds are further allocated between Municipal Purposes and Utilities. Municipal purposes are all those operating and capital expenditures, excluding water, wastewater and solid waste. Any shortfall between revenue and expenditures is funded by general municipal taxes by adjusting the municipal tax rate. Utilities are self-funded by user rates charged to customers and not funded by general municipal taxes. Utility rates are structured to maintain cost recovery for operations and capital projects. In addition to specific reserves to fund capital projects, the City collects offsite levies from developers for the construction of road, water, and wastewater infrastructure based on the impact that new development has on this infrastructure. Balanced Budget Section 242(3.1) of the Municipal Government Act requires that the City’s annual budget must be balanced, budget revenues equalling budgeted expenditures. In accordance with Sections 242(1) and 246 of the Municipal Government Act, the City is required to prepare both an annual operating and capital budget, respectively, based on a calendar year. Section 243(1) identifies which expenditures and transfers must be included in an operating budget. Section 243(2) identifies which sources of revenue and transfers must be included in an operating budget. Section 246 identifies what a capital budget must include. The 2019 Budget and 2018 figures have been adjusted to reflect the change in reporting structure with Human Resources and Safety reporting to the CAO office, and Economic Development reporting to Integrated Growth and Infrastructure. The following charts highlight the changes in budgeted revenues and expenses from 2018. Property tax; Business tax; Business improvement area tax; Community revitalization levy; Special tax; Well drilling equipment tax; Local Improvement tax; Community aggregate payment levy; Grants; Transfers from the municipality’s accumulated surplus funds or reserves; and Any other source. 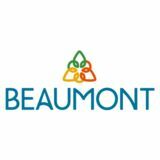 Like other municipalities in Canada, Beaumont provides a broad range of services which are funded from a limited revenue stream with only three main sources: property taxes, utility fees and user fees – including such items as: licenses (pet and business), permits (building, etc. ), childcare, transit fees, and recreation facilities and programs. More than half of the City’s budgeted operating revenues (50.34%, 2018 - 51.2%) come from property taxes paid by residents and businesses. Approximately one-fifth from utility fees (19.27%, 2018 - 20.1%); and from fees and other revenues (22.73%, 2018 - 22.9%), with eight percent (7.66%, 2018 - 5.8%) from transfers from other governments. Property Taxes In addition to the property taxes the City collects for operations, the City collects taxes for three separate organizations, Black Gold and St. Thomas Aquinas School Districts, and the Leduc Regional Housing Foundation. Requisition taxes make up approximately 27% (2018 – 27%) of a property owners total property tax bill. The 2019 Budget also reflects an estimate for supplemental taxes issued in November of each year. The 2019 Budget reflects a two percent (1.88%) increase or $379,300 after factoring in a 3.41% increase in assessment growth in 2018. This increase has been transferred to the mill rate stabilization fund to offset one-time expenditures in 2019 funded through the reserve. Based on 2018 Permits and Value of Construction, we anticipate that the project growth will be as follows: (New Growth) Value Percentage Tax generated(1) Residential $79,941,711 3.00% $499,900 Non-Residential $17,403,129 10.30% $153,200 Total Projected $97,344,829 3.41% $653,100 (1) The tax generated is based on applying the 2018 Mill Rate to the projected 2018 new assessment growth. Final growth numbers will be received at the end of February 2019. Based on the projected growth for 2018, net of 2018 assessment adjustments, the average single family residential assessment is estimated to decrease from $443,432 to $443,052 for 2019, excluding any market adjustment impact. The following table highlights the tax/mill rates for 2019 based on the proposed 1.88% municipal tax increase, noting that the school tax/mill rate is estimated based on the 2018 School Tax Requisition. • New $200 fee for Stop Order Appeal Fee. • Added Subdivision Appeal Fee from Schedule V. • Increase Development Appeal Fee from $57 to $100 (formally in Schedule V). Planning and Development Schedule V • Reduced condominium subdivision fee from $41/unit to $40/unit per condo (Section A) regulations. • Removed the re-issuance of an expired permit fee. Schedule V • Add to the $750/day occupancy fee “at the discretion of the General Manager, (Section C) Integrated Growth and Infrastructure”. Childcare Schedule VII • Childcare program fees were increased by 2%. Protective Services Schedule XIV • Increased Permit to Display Fire Works (high hazard) to $100 from $50 • Increased Administrative fees from 15% to 20% to be consistent throughout. • Added a new fee of $1,200 + Cost of Disposal + 20% for Fire Responses involving Dangerous Goods Overpack Drum (30 gal) w/contents. • Added a new fee of $900 + Cost of Disposal + 20% for Fire Responses involving Dangerous Goods Overpack Drum (20 gal) w/contents. • Added a new fee of $140/hr (or portion thereof) for Municipal Enforcement Officer Responses w/ Patrol vehicle. • Added a new fee of $65/hr (or portion thereof) for Municipal Enforcement Officer Response only. • Added a new fee of $75/hr (or portion thereof) for Municipal Enforcement Patrol Vehicle only. Parks and Recreation Schedule IX • Reduced all pool related fees (membership, daily admission, birthday party bookings, one hour in the pool + extra 30 minutes in the pool, etc.) by 20% and eliminated the 3-Month and Annual Passes, along with the Membership Incentive Dates. • Introduced free admission for seniors between 12pm-4pm. • Reduce lane rental fees to $14.10/hour/lane during prime-time hours and to $9.87/hour/lane for non-prime time hours. • Eliminated the fees for the Multi-Purpose Meeting Room; the Play-Time Program; Fitness Team Training Sessions. • Added a non-prime time lane rental of $11.55/hour/lane consistent with the Schedule X Family Swim Night fee. • Held the prices on Aquatic Program fees at 2018 prices. • Youth Centre rental fees increased from $44.00 to $45.00 per 2 hour minimum. • Added a daily fee for Football and Soccer fields of $168/day for adults and $61.50/day or $20.50/game for youth. • Added a per diamond fee per game or day of $26.00 and $79.00 for adults plus a Schedule XI new rate of $100 per team between August 16-September 30. Schedule XII • Added a per diamond fee per game or day of $18.00 and $54.00 for youth plus a Schedule XII $75 fee per rally cap / rookie team. • Increased KNRRC ice fees starting Aug 1, 2019 by 3%. • Increased KNRRC non-ice fees starting Aug 1, 2019 by 3%. • Increased CCBCC fees by 3%. Transfers from other Governments The City receives grants for various services it provides to the residents and businesses of the City. These services include: Police, FCSS, Childcare, Planning Grants, Recreation and the Library. Investment Income The 2019 Budget reflects estimated interest on reserve account balances in addition to interest earned on net operations for the year. In prior years, this interest was transferred directly to the Mill Rate Stabilization Fund. In addition, interest income includes interest to be earned on the debenture for the Beaumont Sports and Recreation Center (BSRC). Penalties and Cost of Taxes Included as part of the budget are penalty and interest charges on outstanding tax and utility accounts, which have increased steadily over the past few years. Currently, property owners are assessed the following penalties if their property taxes are not paid by: • July 1 – 6% (on current year tax balance); • September 1 – 3% (on current year tax balance); • November 1 – 3% (on current year tax balance); • January 1 – 12% (on total outstanding taxes); • April 1 – 5% (on total outstanding taxes); and • December 1 – 5% (on outstanding supplemental taxes). Utility bills not paid by the due date are assessed an additional 2.6% charge, and if not paid within 120 days are transferred to taxes. Rental Income Rental rates for 2019 reflect the fee increases identified earlier under User Fees. The majority of the rental income is generated through the Ken Nichol Regional Recreation Centre ($555,400; 2018 $546,500) and the Community Centre ($235,300; 2018 - $206,200). Included in the rental income is the Cityâ&#x20AC;&#x2122;s lease with the Library in the amount of $152,100 for 2019, which is offset by a corresponding rental charge to the Library, and $47,000 charged to Early Learning Child Care for the space it utilizes in the Ken Nichol Regional Recreation Centre, which have been net against the corresponding expense accounts. Also, within the Economic Development budget for rental income is potential sponsorship income and rental from the CoWork Initiative in the amounts of $115,000 and $30,900, respectively. Transfer from Surplus The transfer from Surplus reflects the Library surplus which is carried forward from year to year to provide the Library the opportunity to address unanticipated projects without having to come back to Council for approval. The amount needed to provide for the council’s policies and programs. The amount needed to pay the debt obligations in respect of borrowings made to acquire, construct, remove or improve capital property. The amount of expenditures and transfers needed to meet the municipality’s obligations as a member of a growth management board. The amount needed to meet the requisitions or other amounts that the municipality is required to pay under an enactment. The amount to be transferred to reserves. The amount to be transferred to the capital budget. The amount need to recover any shortfall as required under Section 244. Council. CAO Office (CAO, Communications, Safety and Human Resources). Corporate Services (Office Services, Accounting, Finance, Geographic Information Systems and Information Technology). Integrated Growth and Infrastructure:  Planning and Development (Current and Long Range Planning and Safety Codes)  Economic Development;  Transportation, Roads, and Streets, including Transit and Storm;  Utilities (Water, Wastewater, and Waste Management); and,  Environmental Services. Community and Protective Services:  Protective Services (Fire, Police, Community Peace Officers, and Disaster);  Family Services (FCSS, Childcare, Youth Centre);  Recreation and Parks (Aqua-Fit, Ken Nichol Regional Recreation Centre, Parks, Recreation and Recreation Programming, and the Community Centre); and  Cemetery. Library. COUNCIL In accordance with the Municipal Government Act and other Provincial Legislation, Council is responsible for setting the strategic and policy direction for the City. Through the development of its Strategic Plan, Council has set a series of priorities for its term, 2018 through 2021. Budget Highlights Expenses: • Increase in salaries and wages reflects an increase elected official remuneration which considers the elimination of the 1/3 tax deductible afforded previously to elected officials and remuneration paid to elected officials within the Edmonton Metropolitan Area. • Increase in Benefits Expense relates to the increase in salaries and wages; and, calculating benefit cost based on individual positions and employees versus a flat percentage based on type of employment. • Increase in cost of the Edmonton Metro Regional Board of $28,100. Service Enhancements • Part-time Mayor to Full-time Mayor • Creation of armorial bearings for the City ($5,000) • Increase contribution to the Leduc Food Bank from $5,000 to $15,000. CHIEF ADMINSTRATIVE OFFICER The Chief Administrative Officer (CAO) informs and advises Council on strategic and policy direction, while aligning the overall operations of the City with this direction. Appointed by Council, the CAO is responsible for the day to day operations of the City. Communications, Health & Safety, and Human Resources report directly to the CAO. Budget Highlights Expenses: • The increase in salaries and wages reflects the recently completed compensation review, which included a 2.0% Cost of Living Adjustment and annual eligible step increases. • Increase in benefits expense relates to the increase in salaries and wages; and, calculating benefit cost based on individual positions and employees versus a flat percentage based on type of employment. • Reorganization of administrative responsibilities to create a Human Resources Coordinator Position ($77,900) during 2018. • The reduction in materials and supplies relates to the completion of building repairs to the Council Chambers and City Office. • Increase in allocation to reserves based on the net impact from the 2% tax increase, cost savings, and interest being credited to reserve accounts directly. • Increase in consulting fees relating to the bi-annual compensation review to be completed in 2019, net of the bi-annual employee engagement survey completed in 2018, a $15,000 increase. • Increase in consulting fees relating to City Office Review/Redesign in the amount of $125,000. Service Enhancements • Enhanced recruitment methods through leveraging the internet and social media, $20,000. • Initial start-up costs for the implementation of a new leadership training program in the amount $35,000, funded from the Mill Rate Stabilization Fund. CORPORATE SERVICES Corporate Services is a future oriented department which provides legislative support, financial management, information technology, and internal corporate service support to the organization. Service areas include legislative services; accounting and payroll services; financial management; information technology; and geographical information services. Budget Highlights Expenses: • The increase in salaries and wages reflects the recently completed compensation review, which included a 2.0% Cost of Living Adjustment and annual eligible step increases. • Increase in Benefits Expense relates to the increase in salaries and wages; and, calculating benefit cost based on individual positions and employees versus a flat percentage based on type of employment. • Hiring of a Geometrics Analyst ($75,800) to meet the increasing demands resulting from annexation and development pressures. • Increase in software license expense relates to updating software licenses in the amount of $70,000 and $8,600 for increased users requiring access to other operating software. • Scheduled replacement of servers and GFI Plugs to address safety concerns in the amount of $155,000. Service Enhancements • Replacement of Budget and Finance Analyst with a Director of Finance. • Hiring of an Asset Management Analyst ($55,400) to continue the implementation of the asset management system corporate wide. • Hiring of a Network Analyst ($64,500) to investigate and initiate innovative solutions corporate wide. COMMUNITY AND PROTECTIVE SERVICES The Community and Protective Services Department ensures that the residents of Beaumont have access to excellent recreation and social programs, parks, facilities and a variety of development and support opportunities to enhance quality of life, while being committed to providing an effective emergency and enforcement service through professional response and education. Programs include Fire Services, Police Services, Municipal Enforcement, Disaster Services, FCSS Programing, Youth Support, Childcare Services, Recreation Programming, Events, Recreation Facilities (Beaumont Sports & Recreation Centre (BSRC), Ken Nichol Regional Recreation Centre), Parks and Community Centre. The CCBCC budget was developed by staff in association with the CCBCC Advisory Committee in accordance with the policy establishing the Committee. Budget Highlights Revenue: • Fire Services is proactively pursuing the recovery of non-fire response calls and third party cost for cleanup of unsightly premises. • Increase in user fees for Childcare of 2% and Recreation fees of 3% as highlighted previously under the User Fee Section. • Net reduction in childcare revenues based on a change in registration between the different programs offered. • Reduction in rental revenues at the Youth Centre offset by an increase in rental fees at the Community Centre with the relocation of Black Golds Continuing Education program. • Reduction of BSRC membership fees and other pool related fees of 20%. • Reduction in Program Revenue with the construction at the BSRC Facility. • Increase in Grant Revenue relating to the financing of the BSRC utilizing Federal Gas Tax monies and funding provided by the County, amortized over the life of the debenture borrowing to minimize the net tax impact to property owners. • Projected cost-recovery for Ken Nichol is 38.17% of direct expenses, net of rental income for 2019 (2018 – 33.76%). • Projected cost-recovery for the Aqua-Fit is 35.26% of direct expenses, net of user fees and rentals for 2019 (2018 – 42.67%). • Projected cost-recovery for the Childcare is 86.61% of direct expenses, net of fees and grant funding for 2019 (2018 – 83.33%), with $293,300 being funded through taxation, exclusive of internal costs of $639,000, internal rent of $49,400 paid to the Ken Nicol Regional Recreation Centre and $12,200 in amortization. • Project cost-recovery for the Youth Centre is 4.60% of direct expenses, net of fees and community contributions for 2019, with $317,400 being funded through taxation, exclusive of internal costs of $77,900. Expenses: • The increase in salaries and wages reflects the recently completed compensation review, which included a 2.0% Cost of Living Adjustment and annual eligible step increases. • Increase in Benefits Expense relates to the increase in salaries and wages; and, calculating benefit cost based on individual positions and employees versus a flat percentage based on type of employment. • Hiring of a part-time Fire Administrative Assistant ($21,800) to provide direct administrative support to Fire Department. • Extended the Municipal Intern under the Provincial Intern Program for an additional year to provide research assistance to organization as whole. Increase in Debenture Costs (Interest on Debt and Debenture Principal) relating to the construction of the Beaumont Sports and Recreation Centre (BSRC). The exact payments will be based on the interest rate at the time of the actual borrowing. Reduction in Professional and Consulting Services with the completion or near completion of the Recreation and Facilities Master Plan and Fire Services Plan. Increase in Reserve Expense of $100,000 for the Community Centre. Service Enhancements • Hiring of a Director, of Community Services to provide consistency between Departments, providing strategic direction, advice, long range planning and process to Community Services. This position will oversee Parks & Facilities and Recreation and Culture. • Hiring of a School Resource Officer ($93,100). • Continuation of Phase 2 of the Childcare review ($125,000). • Create two permanent part-time life guard positions employees, from the current casual pool, to provide a more positive customer experience and consistent customer service delivery. • Convert one part-time events coordinator into a full-time position to administer special permissions. • Convert casual guest service employees at the BSRC to two full-time employees to provide a more positive customer experience and consistent customer service delivery. • Convert the part-time casual guest service employee at the Community Centre to a full-time employee to provide a high level customer service as the facilities usage increases. • Increase annual grants to $190,000, which includes $50,000 to both the Blues Festival and the Arts Society; $15,000 to the Heritage Society; $5,000 to the Beaumont and District Agriculture Society; and, $70,000 available to other community organizations through the City’s Grants Policy. INTEGRATED GROWTH AND INFRASTRUCTURE Formally, Planning and Infrastructure, Integrated Growth and Infrastructure, ensures that the road network is safe and sustainable; ensures that utility infrastructure meets current standards and responding to emergencies and customer concerns; implementing Council approved land use policies and priorities through an integrated framework, guiding development to reflect Beaumont’s Vision. Programs include: Infrastructure, Project Management, Roads, Storm, Fleet Maintenance, Transit, Utilities, Environment, Current Planning, Long Range Planning, Safety Codes, Engineering, and Economic Development. Budget Highlights Revenues: • Municipal Planning Intern Grant in the amount of $28,700 (see expense explanation). • CARES Grant for Economic Development initiative in the amount of $75,000 (see expense explanation). • CARES Grant for Long Range Planning initiative in the amount of $127,000 (see expense explanation). Expenses: • The increase in salaries and wages reflects the recently completed compensation review, which included a 2.0% Cost of Living Adjustment and annual eligible step increases. • Increase in Benefits Expense relates to the increase in salaries and wages; and, calculating benefit cost based on individual positions and employees versus a flat percentage based on type of employment. • Hiring of an Infrastructure/Utility Administrative Assistant ($71,200) to provide improved customer service, funded through user fees. • Hiring of two term Public Works Operators ($66,000) to maintain the trail system during the winter months. • Hiring of a second Permit Clerk ($66,700) funded through the revenue generated through increased development activity. • Hiring of a Senior Long Range Planner ($124,200) responsible for regional planning initiatives. • Consulting fees of $100,000 relating Functional Planning Study for TWP 510, with funding from the Mill Rate Stabilization Fund. • Consulting fees of $100,000 for a Traffic Impact Assessment of HWY 625, with funding from the Mill Rate Stabilization Fund. • Traffic signal equipment upgrades in the amount of $50,000 to be funded through the HWY 814/50 Street Agreement with the Province; and the purchase of a Traffic Counter funded through grant funding for improving traffic safety. • Consulting fees of $100,000 relating to developing an Inter-municipal Development Plan & Intermunicipal Collaboration Framework with Leduc County, with funding from the Mill Rate Stabilization Fund. • Consulting fees of $254,000 relating to developing an Inter-municipal Planning Framework Agreement Working Group Cost Sharing with City of Edmonton, Leduc County, and City of Beaumont, with 50% of the funding from a CARES Grant and the remaining 50% from the Mill Rate Stabilization Fund. • Hiring of a Supervisor, Safety Codes ($124,500) to provide increased customer service. Position is funded through contract cost savings and related permit fees. • Rebranding costs in the amount $250,000 have been included in the 2019 Budget with funding from the Mill Rate Stabilization Fund. Consulting fees of $150,000 have been budgeted to complete a Business Park ASP in the amount of $150,000 to be funded 50% through a CARES Grant and the remaining 50% from the Mill Rate Stabilization Fund. Establishment of a CoWork site with an initial start-up cost of $41,900 in 2019, becoming selfsustaining thereafter. Start-up funding will be provided from the Mill Rate Stabilization Fund in 2019. CoWork Leasehold improvements of $150,000 to be funded 50% through a CARES Grant and the remaining 50% from the Mill Rate Stabilization Fund. Environmental Master Plan five year update in the amount of $77,000 funded through the Mill Rate Stabilization Fund. Service Enhancements • Hiring of a Construction Inspector / Project Manager ($121,500) to provide support to Infrastructure and Engineering Services in the effective delivery of current service levels and development activities. • Hiring of a Senior Current Development Planner ($121,500) to provide commercial and related development land applications. • Hiring of an Economic Development Business Development Specialist ($101,400) and Economic Development Assistant ($78,300) to assist the Director, Economic Development in meeting the goals identified by Council. • Hiring of a Municipal Planning Intern under the Provincial Intern Program for two years to provide assistance to both Current and Long Range Planning. The costs are partially funded by the Provincial Government in the amount of $43,000 and $23,000 for each year of the agreement, respectively. • Purchase of a Customer Relationship Management (CRM) tool ($10,000). LIBRARY The Library is operated by a Board established by bylaw pursuant to the Library Act and the Municipal Government Act. Budget Highlights • The City provides funding to the Library on a yearly basis. The funding has increased from $779,800 to $831,400, an increase of $51,600. • Increase in Library taxes from $682,500 to $756,900, an increase of $74,400. • The Library Budget includes the operations of the Library Board and the maintenance of the library building by the City. • The Library Board leases the library building from the City under a formal lease agreement. Service Enhancements • Addition of a part-time Circulation Clerk to improve customer service based on current library usage. The Operating Budget by GL Category has been adjusted to reflect the inter-fund transfer relating to the rent charged to the Library by the City $152,100 ($158,600 â&#x20AC;&#x201C; 2018) and grant to the Library to fund their operations in the amount of $812,300 ($779,800 â&#x20AC;&#x201C; 2018). 2019-2023 FINANCIAL PLAN Under Section 283.1(2) of the Municipal Government Act and pursuant to Regulation 192/2017 municipalities in Alberta are required to prepare a three year Financial Plan. The first financial year required in both the Financial Plan and Capital Plan is 2020. The 2019-2023 Financial Plan is based on the following assumptions:  Council’s 2017-2022 Strategic Plan.  Departmental Business Plans.  Net Annual Growth of 3.4%. • As part of Council’s Strategic Plan, Economic Development are implementing strategies to move the current 95-5 municipality tax split (residential to non-residential) to 80-20.  Annual inflation rate of 1.5%.  Opening of Beaumont Sports and Recreation Centre July 2020.  Increase of one RCMP Officer a year starting in 2019/2020 to 2023/2024, with 18 officers.  Fire Department expansion (addition of 3 Officers), offset by an additional municipal property tax increase of $635,200 (2021), $667,000 (2022) and $700,400 (2023).  To meet future service levels, the following new positions have been included in the plan: • 2020 - Maintenance Operator ($56,900); Aquatic Programs Coordinator ($45,900); Asset Management Coordinator ($115,200); Part-time Library Circulation Clerk ($27,000); Community Peace Officer, Level 1 ($94,600) and Part-time Youth Outreach Worker ($39,500); • 2021 – Senior Human Resources Advisor ($101,900); Part-time Library Circulation Clerk ($28,000); • 2022 – Part-time Library Circulation Clerk ($29,200); and • 2023 – Part-time Library Circulation Clerk ($30,500). The amount needed to acquire, construct, remove or improve capital property. The anticipated sources and amounts of money to pay the costs of acquiring, constructing, removing or improving capital property. The amount to be transferred from the operating budget. Human Resource Information System (HRIS) - $75,000 A HRIS, is basically an intersection of Human Resources (HR) and Information Technology (IT) through Human Resource (HR) software, facilitating HR activities and processes electronically. HRIS systems can be used operationally, tactically, strategically and comprehensively. The computerization of HRIS has resulted in an integrated database of human resource files, employee files, position, skills inventory files, affirmative action files, job analysis and design files, occupational health and safety files, and many other human resource files are constructed in a coordinated manner using database management systems software so that application programs can produce reports from any or all of the files. Centreville Phase 2 Storm Upgrades - $685,000 In accordance with the Downtown Urban Design Concept Plan (DUDCP) implementation plan upgrades to the storm water systems in Centreville are required to accommodate additional density. Design work was completed in 2016 and updated with the 50 Avenue Streetscape preliminary design. The design determined the trigger points and capacity thresholds to coincide with development activities and staging. These trigger points and thresholds have been identified as immediate for the storm upgrades within the redevelopment area. As per the Downtown Urban Design Concept Plan, Section 6, Action #7Phase 2 of Infrastructure Upgrades of Stormwater Management, an estimate at the conceptual level of $685,000 has been allocated. Truck for New Safety Code Officer Lead - $33,000 With the hiring of a Safety Code Officer Lead (SCOL) in 2018, a new four-wheel drive truck is required to assist the SCOL in performing his duties. In addition to normal duties, the SCOL will be required to conduct site inspections at residential and commercial construction sites. The use of a personal vehicle is not adequate given the conditions of construction areas. Pick Up Truck – Replacement of 2005 GMC - $40,000 Replacement of an existing 2005 GMC Sierra truck as it has exceed its recommended replacement life of 10 years. The replacement vehicle will be a new ¾ ton quad cab truck, which will allow for the movement of operators more efficiently. In addition, the specialized box and additions will increase the effectiveness for performing key tasks, like hydrant maintenance. With the growth of the community, this vehicle will be dedicated to utilities and equipped with specialized tools, increasing efficiency. Pick Up Truck – New - $45,000 A new pick-up truck will increase both the efficiency and effectiveness of Public Works staff by allowing the vehicle to be modified to meet work requirements, which we cannot do with the current rental vehicle. In 2018, $7,500 in rental charges were incurred during the summer, which are anticipated to increase in 2019 with the anticipation that the vehicle will be need for the entire year. In addition, it was found that a rental truck doesn’t have the necessary safety and organization accessories to compliment the tasks at hand leading to inefficiencies. Grader – New - $435,000 A third grader will maintain our snow service levels into the future. Since our last grader addition in 2011, the City has grown by 25.5km of roads, accounting for 24% of the total roads in City. In an average winter, we estimate that 200 hours of grader time will be required in 2019 progressing to 400 hours of grader time by 2023, which works out to $40,000 per year in 2019 and $80,000 per year by 2023. Tandem - New - $195,000 A second tandem truck is required to maintain current ice and snow control service levels into the future. The City has 55% more roads (56km) than it had in 2005, with more km’s being added with new development. By maintaining snow and ice control in-house, service levels will be consistent throughout the community and reduce contract service costs. In an average year, we estimate that 200 hours of tandem time will be required in 2019 progressing to 400 hours of tandem time by 2023, resulting in savings of $80,000 per year by 2023. The City’s existing loader is 12 years old and has accumulated 8,000 hours compared to industry best practice recommending that a loader be switched out every 10 years. The risks associated with running equipment past their recommended replacement would include additional downtime and increased maintenance costs. Maintenance issues can impact service levels, as well as lead to increased maintenance costs. An example of a service level delay is when the loader is not available to load sanding trucks, thereby impacting the level of winter snow and ice control. To date, over the past five years an average $2,500 has been spent yearly on maintenance, which is well below industry average due to how the machine has been utilized. It is anticipated that maintenance issues and costs will increase, and by replacing the loader at this time these risks would be mitigated. It is anticipated that the loader could be sold at auction for a value of approximately $65,000, reducing the cost of a new loader of $230,000 to $165,000. Issue: Major road and sidewalk sags at service locations (water, sanitary, storm, catch basin crossings, shallow utility crossings). Reason: Poor subgrade compaction, poor compaction material, high water table and light asphalt overlay. Solution: Complete road base reconstruction, miscellaneous sidewalk replacement. Issue: Major road failures and high moisture in the subgrade. Reason: Poor subgrade compaction, poor compaction material, high water table and light asphalt overlay. Solution: Complete base reconstruction and installation of storm sewer including catch basins to minimize overland drainage. This work will require road rehabilitation. 2019 Four Seasons Estates Drainage Remediation - $65,000 This project involves connecting the concrete swale built in 2018 to mitigate standing water issues. The current grass swale in Four Seasons Estates is very flat casing water to pool and when City equipment cut the grass large ruts are created, creating spots for standing water, which presents a potential risk to residents utilizing the area. A concrete swale will be similar to the swale built in 2018 and will complete the upgrades to the park. St. Vital Pumphouse Upgrades - $631,350 The St. Vital Pumphouse has inadequate pumping capacity to meet peak water demands causing the water in to be inaccessible. Due to the limited pumping capacity, Beaumont has experienced restrictions on non-essential water use at times for the past couple of years. The upgrade will reduce the need to implement water restrictions, as water demands increase with Beaumont’s growth. If upgrades are not implemented, water restrictions will only become more common. Though additional pumphouses are planned, construction is not feasible at this time and the upgrade would bridge this gap. During the construction we will be looking at salvaging opportunities. This project will upgrade the pumping capacity and control logic at the St. Vital Pumphouse as per the Pumphouse #2 Operational Study conducted in 2018. Main Pumphouse - Pump #7 Replacement - $45,000 Pump #7 is beyond its expected life cycle and is beginning to fail. When a pump is removed from the system, it causes more strain on the other pumps and reduces the redundancy which is critical to allow for unforeseen issues with other pumps. In addition, the replacement will assist in reducing the impact of future water restrictions. Self-Contained Breathing Apparatus - $229,000 Upgrading twenty Self-Contained Breathing Apparatus (SCBA) and air cylinders to ensure the Beaumont Fire Services would meet the standards set out by National Fire Protection Association (NFPA). NFPA 1981 standard on Open Circuit Self Contained Breathing Apparatus for Emergency Services is revised every 3 – 5 years. Currently the Beaumont Fire Services are using SCBA ranging from 1997 to 2009 editions. Although the SCBA’s are tested annually for functionality, they are not compliant with the current standards. Replace Unit 702 (2006 Dodge) - $56,400 This asset is due for replacement. It is important with the growth of a community that the life cycle process is followed and standards are kept. The Parks department has acquired fleet that has been life cycled out by other departments and this practice doesn't always lead to good production results. From a safety perspective, it’s important that we have reliable fleet as we are dealing with traffic, roads, and summer student employees. Replace Unit 706 (2000 Ford F150) - $45,000 This asset is due for replacement. It is important with the growth of a community that the life cycle process is followed and standards are kept. The Parks department has acquired fleet that has been life cycled out by other departments and this practice doesn't always lead to good production results. From a safety perspective, itâ&#x20AC;&#x2122;s important that we have reliable fleet as we are dealing with traffic, roads, and summer student employees. Replace Unit 758 2009 Toolcat w/attachments - $70,000 This unit is due for replacement in 2019 because of depreciation, maintenance costs, and current sale value. Replace Toro 400 Mower (2009) - $50,000 This asset is due for replacement and will be replaced by a Toro Grounds Master 5900 16 Foot Mower. The 16 foot mower can mow wide areas faster and is also able to reach into places such as under trees and over wet areas without getting stuck or leaving ruts. Replace Unit 764 (2012 Rotary Mower – Deck) - $10,000 Of all the units in the fleet, this unit has cost the Parks Department the most on parts and labor. This unit is constantly in the shop for repairs and gets the least amount of hours put on it yearly because it is less user friendly and needs repairs more often. The resale value of this unit will be much greater if it is sold now then in a few years. The unit will be replaced with a 2019 Toro Grounds Master 4000 12 Foot Mower. Replace Unit 772 (Shared Cost w/ Operations) - $128,100 This unit is due for replacement in 2019 because of depreciation, maintenance costs, and current sale value. The new unit will be attached to a truck versus being a pull type unit, not requiring down riggers, increasing productivity. The unit is used by both Parks and Facilities, and Infrastructure. Infrastructure uses it for installing Christmas decorations and banners, and Parks and Facilities Department use it for tree pruning, hanging banners, changing lights and some roof maintenance such as gutter cleaning. In addition to being used as a man lift, it will be used to transport staff to different job sites. Currently, the Parks Department contracts out most of the pruning and removals within Beaumont. With this truck and properly trained employees, it will be used on a weekly basis for pruning, reducing the cost of contracting out this activity. Replacing Unit 772 at this time, will result in a higher salvage value. Replace Unit 773 2007 Cargo Trailer - $13,000 This unit was due for replacement in 2017 because of depreciation and maintenance costs. A 20’x8’ cargo trailer to accommodate the increase in demand for outdoor setups and City functions. The trailer will transport picnic tables, chairs and 6’ tables. Playground for the Colonial Estates area as there is not currently a playground within the neighbourhood. Columbarium - $40,000 The purchase of a 48 niche Columbarium is being recommended for the Clearwater Cemetery. Since Budget 2016, it has come to the attention of Administration that there are several discrepancies of ash plot locations. Because of this, approximately 24 ash plots are no longer available. With the purchase of a columbarium, any lost plots will be regained. KNRRC Roofing 2 Phase - $180,000 There have been several leaks over the last 5 years across the span of KNRRCâ&#x20AC;&#x2122;s roof. In 2018, a site inspection of the roof was conducted, as a result of heavy rains penetrating the membrane of the building. The contractor recommend that we phase the project in two parts: (1) Roof Section A, 9400SF $170,000; and (2) Roof Section B, 7475SF - $127,000. 2019-2023 CAPITAL PLAN Under Section 283.1(2) of the Municipal Government Act and pursuant to Regulation 192/2017 municipalities in Alberta are required to prepare a five year capital plan. The first financial year required in both the financial plan and capital plan is 2020. The 2019-2023 Capital Plan (Appendix 4) has been developed based on the following: • Projects that provide strategic benefit will be sought out & considered. • Federal & Provincial mandates and legislation will be followed. • Maintenance of current infrastructure is a priority and is funded annually to avoid infrastructure deficits. • Capital will be maintained to ensure public safety. • Projects for sustainable and beneficial growth will be continually reviewed and recommended. • Sustainable and responsible long term funding plans are developed and in accordance with established policies. The debit balance in the Water Offsite Reserve account represents the front ending of the Cityâ&#x20AC;&#x2122;s St. Vital water reservoir. The Offsite Levy Model has been structured to recover these outstanding amounts. Capital grants are funds typically received from senior levels of government designated for specific projects and are a key form of funding. Capital projects include major road, water, wastewater, and storm infrastructure, and facilities. As grants are applicable to specific projects, they must be used for that project. If after a grant has been awarded a project is cancelled, the grant monies must be returned. The following schedule reflects projected expenditures to the end of 2018, projects being carry-forward to 2019, and anticipated capital grant revenues based on 2018 amounts received. 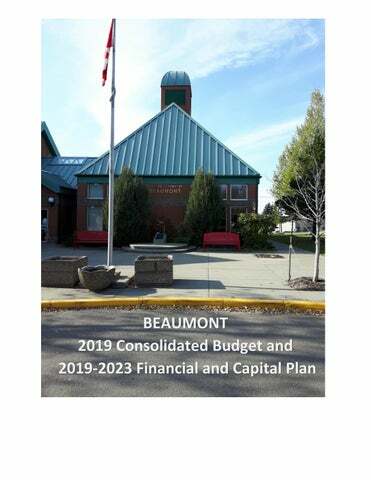 In 2018, Beaumont received $5,477,868 from Municipal Sustainability Initiative for Capital ($2,860,206 in prepaid MSI Capital for 2018 and 2019; $1,518,462 for the 2018 MSI Capital Component and $1,099,200 BMTG Component) and $1,010,423 from Federal Gas Tax Funding. Municipalities can apply for prefunding of capital projects noting that they will be responsible for any debt charges.